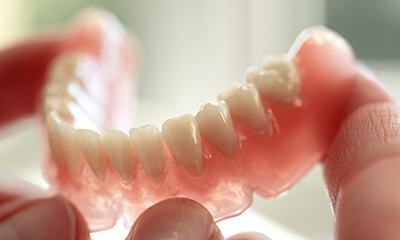 When it comes to tooth replacement, dentures are the oldest solution still available today. Thankfully, these prosthetics have greatly improved over time, providing modern, reliable coverage for countless patients who’ve suffered extensive tooth loss. If you’re interested in undergoing a denture consultation, please give Dolan Dental a call today! Our Wethersfield team looks forward to meeting you and helping you regain a confident, functional smile. Depending on each patient’s unique needs, our doctors may recommend full or partial dentures. Partial dentures are designed to recreate certain teeth along an arch of the mouth, while full dentures replace the entire arch. Both styles of dentures are designed to be removable in nature, which makes cleaning and storage more convenient. There are additionally two different styles of full dentures: conventional and immediate. Conventional dentures are designed to be placed within the mouth after the patient’s remaining teeth have been removed and their oral tissue has healed successfully. This means that in the months between, the patient will be without teeth. Alternatively, immediate dentures are designed and crafted before the teeth are removed so that they can be placed directly after the procedure. Because the mouth will change shape as healing takes place, patients will need to schedule a follow-up visit at Dolan Dental so that we can refit their denture later on. Last but not least, implant-retained dentures are an excellent option for patients who are looking for more permanence in their tooth replacement. By anchoring your new prosthetic securely in place within the mouth, the device feels and looks more natural than ever before! What Should I Expect After Getting My New Dentures? It is likely that you will need some time to adjust to the feel of your new full or partial denture. Many patients struggle to find the proper resting place for their tongue, or they may think the device is too bulky and loose. However, over time, you should become fully adjusted to eating and speaking properly with the denture in place. It is also very important for patients to treat their denture just like it’s a set of natural teeth. This means that daily brushing to remove trapped food and bacteria is a necessity. After the denture is removed from the mouth, it’s important to place it into a glass that contains either denture cleaning solution or water at room temperature; avoid hot water, as it can warp the design of the denture! 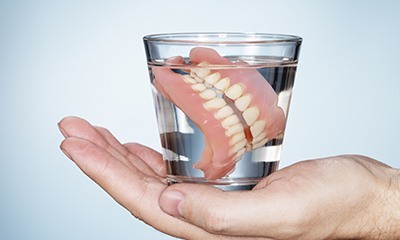 If you’re struggling with dentures that simply don’t feel right even after weeks have passed since you received them, please don’t hesitate to reach out to our Wethersfield, CT location. Our doctors will work with you to help determine the problem and provide the necessary adjustments.